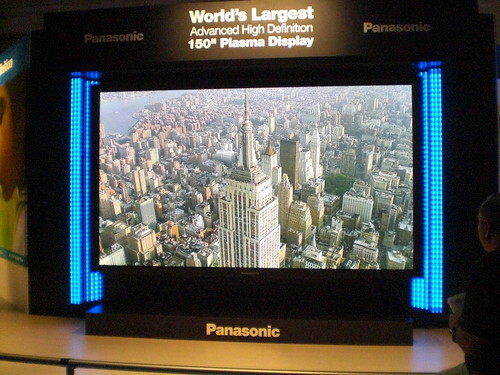 Panasonic has stolen the show at CES 2008, day one, with a gigantic 150-inch plasma. Looks like movie theater is shifting in people’s living room (Well, it is another story that one might need to build a custom made home just to install it). Photos of many new hi-tech displays in CES 2008 can be seen in ytechblogs’ flickr photostream. I copied the photo of the world’s largest plasma TV below. This entry was posted in fun stuffs, General. Bookmark the permalink. It may be big, but if the resolution is only 1920×1080 or something, it wouldn’t really be worth it. But if it’s something like 3840×2160, then it would be ok.
I’ve seen it in real life …. It really IS huge! And the quality of the image is surprisingly good. I expected much more of a stretched image, but even from a small distance, the image is very crisp! Besides, you’ll need to take some distance from the screen to be able to see the entire screen. thats damn huge! but im a bit sceptical about the quality. Would be amazing when used with ps3!!!! Hey man (Riri), don’t be daft there is no such resolution available on TVs. Even if there was there is no current broadcast material with such a high resolution. The currently available DCT computation on signals is not capable of such very high quality pictures.